For this week’s vase, I feature the last of my peonies. This week’s warm temperatures will finish them for the year. They were spectacular and I am happy I got to enjoy them for three weeks. Yellow thermopsis (Thermopsis villosa), an American native that I rarely see in gardens (though who knows why, as it is a wonderful perennial that I look forward to every year), and catmint (Nepeta racemosa) provide vertical accents. I’ve tucked in a few small blossoms of white sweet William (Dianthus barbatus), a plant that I discovered growing in the lawn when I moved here 25 years ago and still comes up every year. It is likely a heirloom variety. Another favorite native, daisy fleabane (Erigeron annuus) and lady’s mantle (Alchemilla mollis) are used as filler. A few leaves of a blue hosta are tucked in to compliment the blue tones of the catmint. I’ve used an antique green hyacinth glass as my vase, one I’ve had for 40 years (oh, my! and it was old when I got it!). 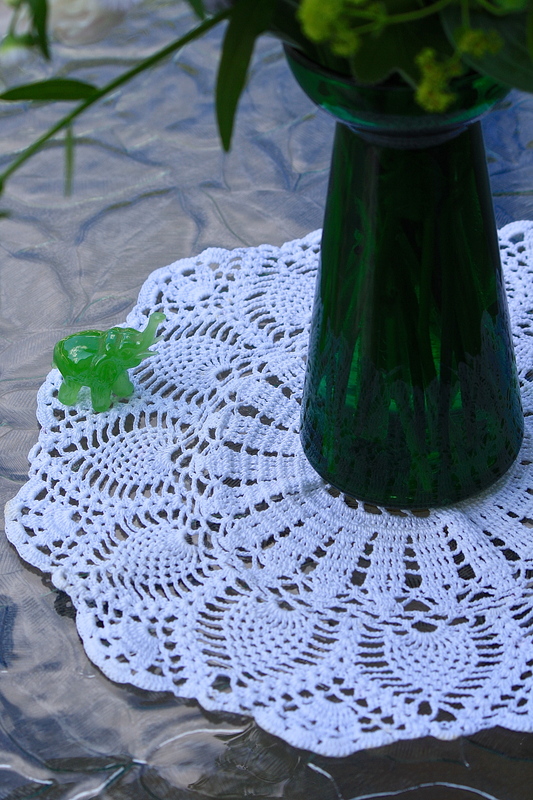 It rests on a hand-crocheted doily from my collection – a pineapple pattern that I think is so pretty. 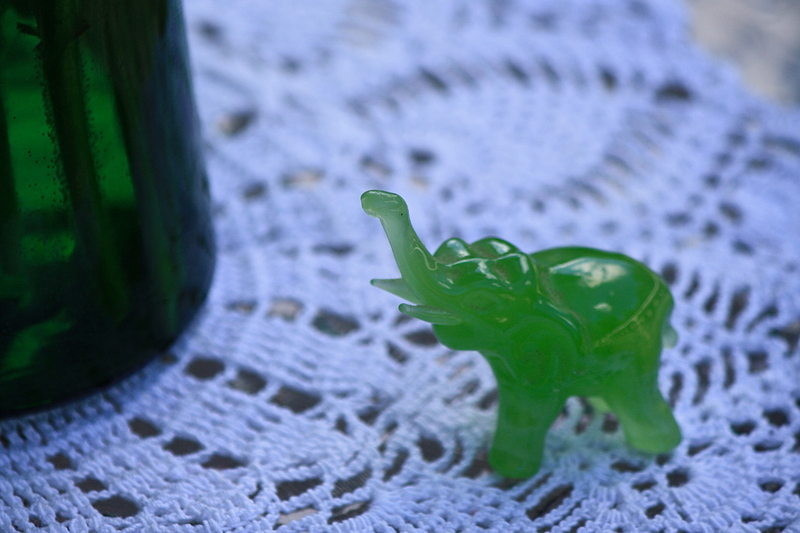 The little jade elephant is an old carving that belonged to my late mother-in-law. Thanks to Cathy at Rambling In the Garden, who hosts a weekly meme to showcase what is blooming in our gardens, creating arrangements to enjoy inside our homes. Wander over to see what gardeners all over the world are arranging this week. Feel free to join in, sharing your own weekly vase with a link to Cathy’s blog. 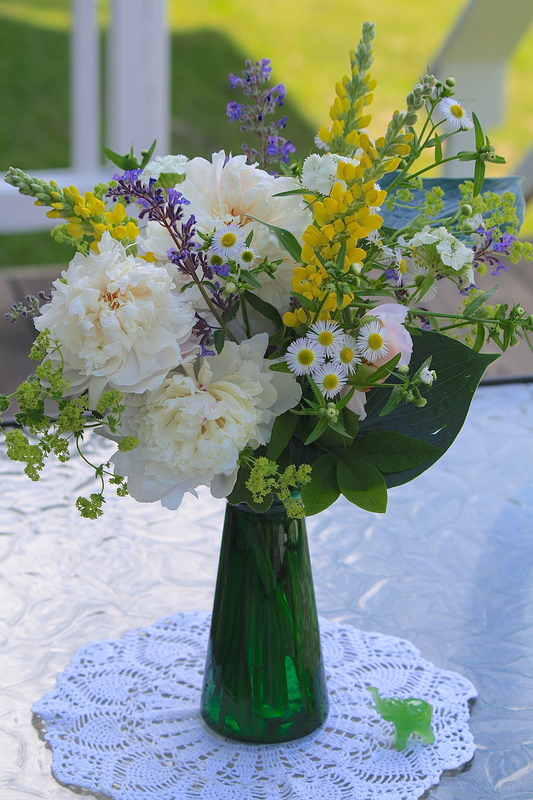 This entry was posted in Country Gardening, My Photos and tagged catmint, daisy fleabane, dianthus, flower arrangement, flowers, gardening, gardens, In a Vase on Monday, meme, peonies, photography, sweet william, thermopsis, Weekly Vase Challenge. Bookmark the permalink. Ah, summertime is the best! Thanks! Very beautiful Eliza, nice work! I am learning so much from taking part in this meme. Your vase combines so many beautiful blooms in such a pleasing and well-balanced way, it is really lovely. These are some of my favorite postings, Eliza. I love when you title pops up. 🙂 🙂 🙂 That makes me feel so good, thanks Kim! Once again Eliza, thank you for sharing your Peonies with your readers. Hi Maureen, I’m glad the arrangement brightened your day. 🙂 Yes, thermopsis, a southeast US native, is of the legume family. Good spotting! So beautiful, Eliza. You are an artist. The flowers are so fresh and pretty! Great details! With all your exquisite details and those beautiful flowers, each arrangement is truly a work of art Eliza. 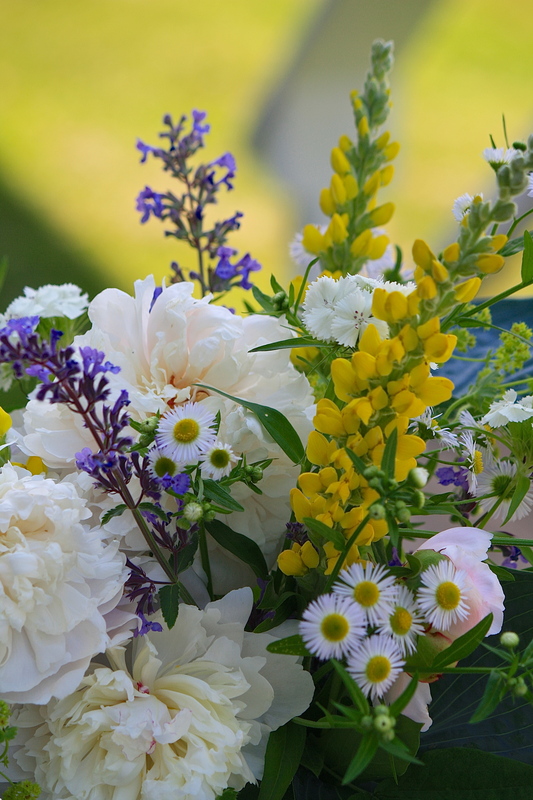 A very pretty collection of flowers Eliza, and so beautifully arranged! I also have some white Sweet Williams that pop up every year and I do love them. A lovely arrangement, Peonies are one of my favorites as well. A beautiful colorful vase with a favorite yellow and purple combo. I do love the fleabane and the Thermopsis villosa which is native the the Appalachian Mtns in the US. It reminds me of Baptisia which I do grow and love especially in a vase. I am also using the beautiful Lady’s Mantle flower too…just perfect in a vase. Thanks, Donna. I also love lady’s mantle as a filler, it is a lovely color that compliments everything and is light and airy. Your arrangements this week are so lovely! I love the way you show them in photo collages, a technique that seems beyond my expertise! Eliza, this is a beautiful arrangement and beautifully photographed. Like Donna, the Thermopsis reminded me of baptisia. I’d love to have a Sweet William pop up every year. I’m having a difficult time getting it established in my garden. Thank you! Yes, it is like a baptisia or lupine, both being legumes. Sweet William is often biennial, but I have two varieties, the white and a red-white bicolor, that come up every year. Maybe try a heritage type? Gorgeous arrangement. AH! Thermopsis. Thank you again! I’d been looking for the name of that! It almost never fails that when the peonies are just reaching peak bloom we have a hard rain – or several. But we have had an enormous amount of blooms this year. And I have been cutting heaps – greedy flower gatherer that I can be. So I’ve had a few days of a heady pink heaven indoors. Beautiful arrangement Eliza! I love Lady’s Mantle. I also love that Yellow Thermopsis – indeed who knows why we don’t see more of that around! 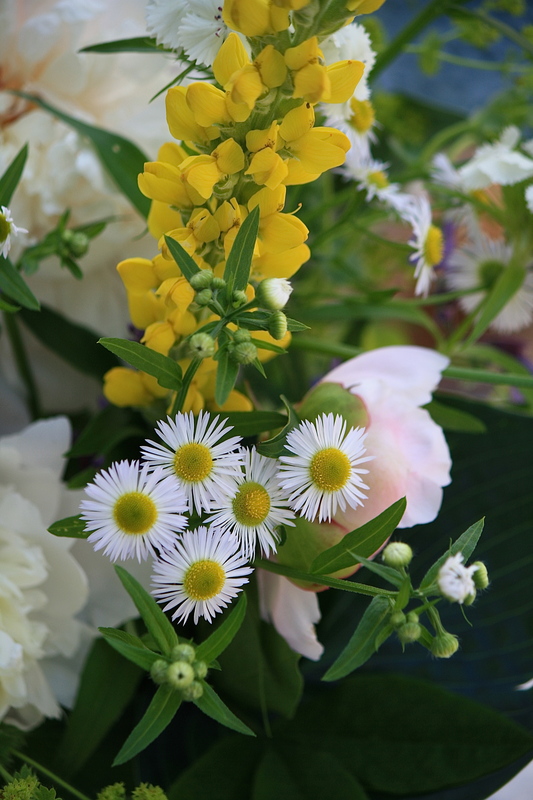 I have a lot of fleabane this year – I confess I have been weeding it out of my beds. Big bad Kathy. Thanks, Kathy. Fleabane is prolific and I do weed it out of much of the garden, but I leave patches of it at the back of the beds where its height works. And, of course, it is in the fields as well. Great pollinator plant! It’s a pretty and well-balanced arrangement. I love the addition of the lupine-like Thermopsis – it adds zing! Thanks so much, Kris. Much appreciated! Gorgeous, Eliza. I love not only the flowers (and your explanation of them) but also the vase and the elephant and the doily. Everything in your photo has a story. So thoughtful. What a beautiful arrangement, Eliza. You’re a true artist. Gosh. You really have a great eye for these arragements. Your cases are always perfect. Love the deep green against teh gentle flower colours. Thank you, Robbie. Yes, white peonies, probably ‘Festiva’ would be my guess. were they fragrant?I only have the pink ones. My mother when she was visiting one year went out there and clipped them and brought them inside four a centerpiece. I had no idea they were fragrant! Oh my-they filled the house. I always forget to clip them + when I remember it is usually too late. Wonderful photographs of beautiful flowers.